Golaem Crowd Settings dialog allows to handle several settings related to Golaem Crowd. 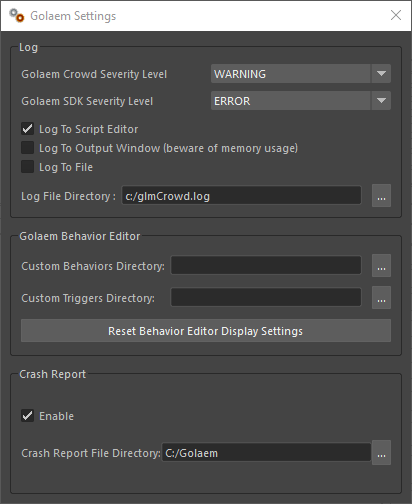 The log levels for Golaem Crowd or the internal components (SDK) can be changed at any time. This can be useful for debug purposes when experiencing inconsistency behaviors in a simulation. To change the log level of either Golaem Crowd or Golaem SDK, select the desired level on the dropdown button. Notice that a low log level can be time consuming, especially when dealing with a large amount of entities. By default, log messages are displayed in the Script Editor. They can also be flushed in a file (glmCrowd.log located at the specified directory) or in the Output Window. Finally be aware that logging in the Output Window is memory consuming as long as it cannot be cleared. Change the Behavior Editor custom directory in which Custom Behaviors files are saved. This directory can be shared between several users. Reset all Behavior Editor display settings, like Behavior Library and Behavior Outliner positions, with the "Reset Crowd Behavior Editor Display Settings". Enable or disable the Crash Report and choose a save directory. The Crash Report (*.dmp) can then be sent along a support request.